The Italian Carlo Fossa-Mancini (1854-1931), was a talented hydro engineer, known for the design and building the aqueduct of the valley dell'Esino. For us Carlo Fossa-Mancini is interesting mainly for the creation of the adding machine Indispensable in 1890s (probably in 1893, first patent was granted in 1896). In 1898, at the Exposition Nazionale di Torino, the machine was awarded a gold medal for "it can make additions of any number easily and in a very short time". The device was patented in Italy (patents №№ IT42837 from 1896 and IT49628 from 1898), France (FR272735 from 1897) and Great Britain (GB189904489 from 1899). In the english patent is presented not only the stylus set input mechanism, but also a key-driven input mechanism (see the upper drawing). The device is an 8-place adding machine, set by stylus (or by keyboard). It is a wooded device, 20 cm long, 12 cm wide and 13 cm high, weight 1950 grams. The dials were placed not on the same plane on different vertical axles, as it was in the Pascaline, but vertically arranged on one common horizontal shaft. The individual numeral wheels are printed with four groups of the digits 0 to 9. Entering the individual values is made by pulling down the respective numeral wheels of the number to be added until encountering a positive stop. The respective sums of the entered numbers appear in windows in front of the machine. The last numeral wheels to the left causes a bell to sound with every quarter revolution as a sign that capacity of the device has been exceeded. Fossa-Mancini designed the mechanism of the tens-carry in an original way, somewhat similar to the sautoir of the Pascaline. In order to facilitate the multiple tens-carry action (e.g. 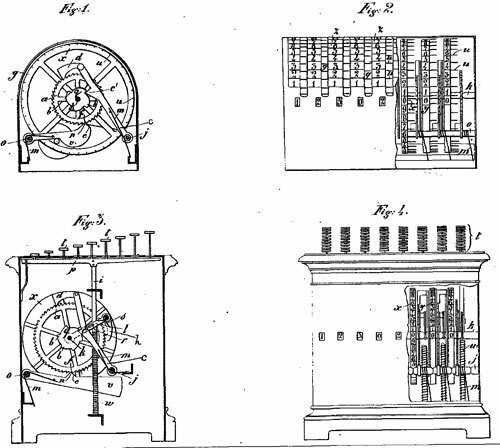 during adding 99999999+1), which will require a huge friction and moments of inertia to be bridged over, Fossa-Mancini provided a massive crook (marked with c on the patent drawing) with a catch (d) for each wheel. The crook is pressed against the gear-wheels by means of a helicoidal spring (m). Every time a wheel is advanced by one tooth, its crook rises slightly. When you go 9-0, the catch falls (pressed by the helicoidal spring) on the next wheel to the left and gives him a blow sufficient to advance it to 1. In addition there is a tricky mechanism, refined enough to prevent the advance to be excessive. So when the operator has 999999 and add 1, he will hear a rapid ticking all the wheels and taking forward without effort, as by magic. 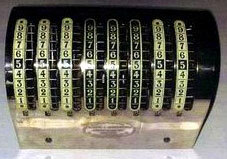 Despite his robust and reliable construction, the adding machine of Carlo Fossa-Mancini didn't become a best-seller. 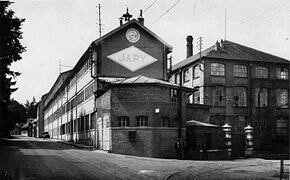 It was in production for several years, starting from 1900, in the factory of the french company Japy Frères & Cie (manufacturer of clocks, coffee grinders, typewriters, enamelware, kitchen utensils, office machines, etc.) in Beaucourt, a small village at the end of the principality of Montbéliard (see the nearby image). It seems only a few hundred adding machines have been produced. The Indispensable do not seem to have achieved a market success and production soon came to an end, but decades later Fossa-Mancini's design was resumed by several producers in Italy (Brevetti Lanza's Addipresto), Germany (Addi, Comet, Argenta), USA (American Adder, Todd-Star, Little Geant), Japan (Addimat) and Hong Kong (Swift Handy), until the mid-1950s. All those clones were cheap, reliable and easy to use. Not a whole lot is known of Carlo Fossa-Mancini. He was born on 29 October 1854 in Jesi, Ancona, to a noble and wealthy family, owner of lands, houses and a castle in Castelplanio (AN), Italy. His father—Raffaele Fossa, a member of the first City Council of Jesi in the new Kingdom of Italy, married in 1852 to Enrichetta Mancini, thus creating the branch of the Fossa-Mancini. They had three sons—Carlo, Eugenio and Adolfo (only Eugenio had children, and his son Enrico Fossa Mancini (1884-1950) became a famous Italian geologist). Nowadays the family home Fossa-Mancini (Palazzo Fossa Mancini) was taken over by the municipality and is now the town hall. A small museum displays memorabilia in the family, furnishings, and one of the few surviving copies of the Fossa-Mancini adding machine. Carlo Fossa-Mancini was several years professor at the University of Pisa, and he was the author of quite a few scientific treatises and books, for example: Theory of the hydraulic ram (1890); Study on the rotary pump (1891); On the apparent motion of the plane of oscillation of the pendulum (1891); Irrigation and drinking water in the valley dell'Esino (1893); A critical study on Poynting's theorem (1912); Theory of the hammer (1915); Rotation of a solid about an axis (1916); What the war teaches us (1920), etc. Carlo Fossa-Mancini was mayor of Castelplanio in 1913-1914. He spared his time to religious works and charity, and he founded the branches of the Catholic charitable organization Conference of San Vincenzo di Paoli in Jesi and Castelplanio. Carlo Fossa-Mancini never married and died on 28 November 1931 in Jesi.